Light is also movement. For this reason we offer a wide range of custom solutions for DMX motorisations and pole-operated systems. Our solutions come from an experience gained over the years, the deep knowledge of the products on the market and the specific needs of the Entertainment world. These are customizations designed and developed from time to time to offer the solution that best suits the customer’s needs. Our motorised systems are able to move any theatrical and television lighting fixtures of our production and of the other main brands, but also smoke machines up to video projectors. The ARC SYSTEM yokes are designed for all those who want to maintain the superior lighting performance of classical products, highly increasing the flexibility of use with a great saving of time in focusing and repositioning. The system, available with 2 or 3 parameters, allows the high precision focusing of pan and tilt, as well as of the focus or the iris through a 16 bit DMX signal. The system consists of a power supply and a DMX reader that controls 2 or 3 DC motors as well as supplying power and DMX signal for other possible accessories such as color changers, gobo rotators, etc. The focusing is particularly accurate thanks to the use in the pan and tilt of a double control both with encoder, for better speed control, and with potentiometer, for the constant memorisation of the position. This way you have absolutely soft movements even at low speeds as well as in acceleration / deceleration. In addition, the fixture keeps its position either in case of power failure (no reset) or forced displacement from its position (to change the lamp). The motors are oversized and totally silent, with a mechanical safety clutch to prevent any possible crash/collision against obstacles and automatic shut off until the DMX command signal is reversed. The horizontal rotation is more than 360° to avoid dark corners in the scene and 270° for the vertical one. The setting of the tilt, pan and focus limits menu allows to avoid the collisions with the scenographies, the positioning beyond the limit prescribed by the lamps or the zoom stroke according to the length of the luminaires. In addition to theatrical and television use, the yokes are also used for positioning video projectors, smoke machines, loudspeakers, etc. with a maximum load limit of 30 kg. 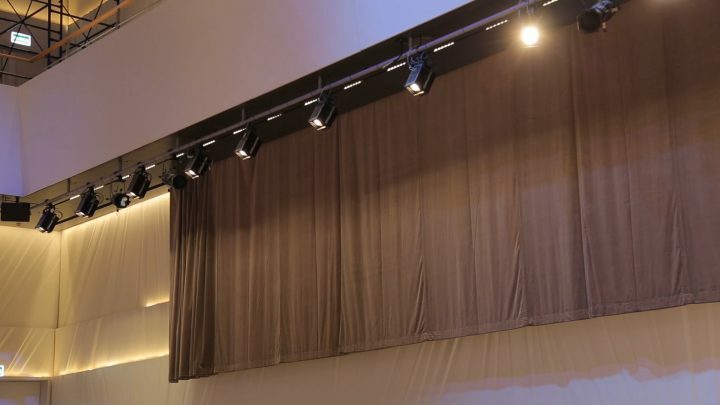 The yokes can work either hanging from structures with fast-fit hooks already supplied, or removing the hooks, positioning them on the stage with a suitable stabilizing base. If desired, the motorization can be switched off and the luminaires keep their position (to avoid unwanted starts for false maneuvers) and, thanks to the clutch, can be manually focused in case of lack of the console operator. If you want to facilitate the focusing of your fixed luminaires through a DMX motorisation, consider whether to mount directly on your fixture a Spotlight ARC System yoke! As an example, see here an abstract of our many possible solutions. The following News comes from Light Sound Journal, the first real multilingual world network for information about professional Entertainment. A real tool that allows professionals to get timely information on events and technical news of the sector all over the world. Many thanks to its staff for the great job done. The opening of the Zaryadye Moscow Concert Hall, a significant event for the Russian capital, took place on the 8th of September 2018. The event had a high-profile guest list, attended by the President of Russia, the Prime Minister, the Head of the State Duma, the Patriarch of Moscow and all Russia Kirill, alongside many other officials, politicians and cultural figures. The event’s gala concert was accompanied by the Mariinsky Theatre Philharmonic Orchestra, conducted by Valery Gergiev. Performing also were world -famous opera stars Anna Netrebko, Yusif Eyvazov, Ildar Abdrazakov, Albina Shagimuratova and Juan Diego Flores. The first concert of the season, taking place the following day, featured the Russian National Orchestra conducted by Mikhail Pletnev, alongside opera soloists Krasimira Stojanova, Francesco Meli and Ildar Abdrazakov. The DOKA Center Company began its work on the Zaryadye project in 2015, when the concept and technical elements were being designed. The company was actively involved in this phase. As to equipment volume and density, this project has been one of the most complicated cultural structures ever to be built in Russia. The historical decision of making the park beside the Kremlin walls was made back in 2013. According to the project details, every corner of Zaryadye represents specific geographic zone of Russia – northern nature, forests, meadowland and steppe. The concert hall is situated in the eastern part of the Zaryadye park zone. The building is an important element of the park, featuring a mass of complex design and engineering solutions. There are two halls in the stage complex of the philharmonic hall, with the larger space seating 1600 and the smaller searing 400. The venue’s largest hall is second to none in Russia in terms of its level of mechanisation, with a vast number of inbuilt engineered solutions and technologies. Because of this, the venue is suitable for any type of event, from classical music concerts and theatrical performances, through to international conferences and touring entertainment. All of these options are possible by means of the modern mechanisation of the hall, alongside carefully selected lighting equipment. This equipment is used for side and front lighting of the stage and the auditorium during TV filming. A high power rating of 450W allows for the luminaires to be used over long distances. RGBW and TW light systems help to colour the hall, as well as illuminate it with excellent levels of white light with the proper colour temperature, without the need for classic film filters or gels. Spotlight LED profile projectors are used in places in which it would have been impossible to place powerful halogen projectors due to their high heat output. The hall décor is constructed from valuable wood species, many of which shouldn’t be exposed to temperature changes. 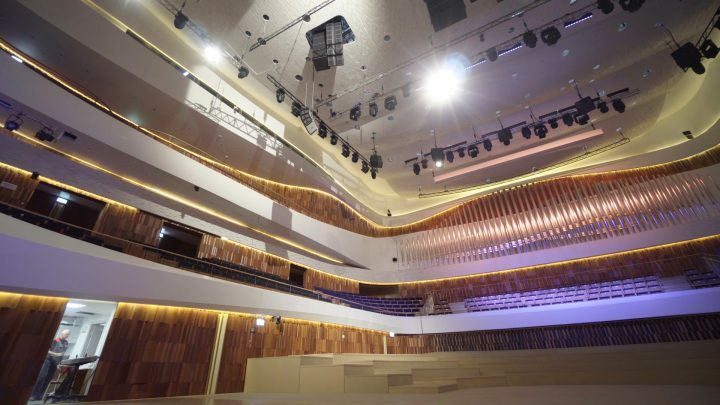 The proper selection of the equipment is helping to maintain the hall dressing for years to come, without disrupting the space’s acoustic properties. 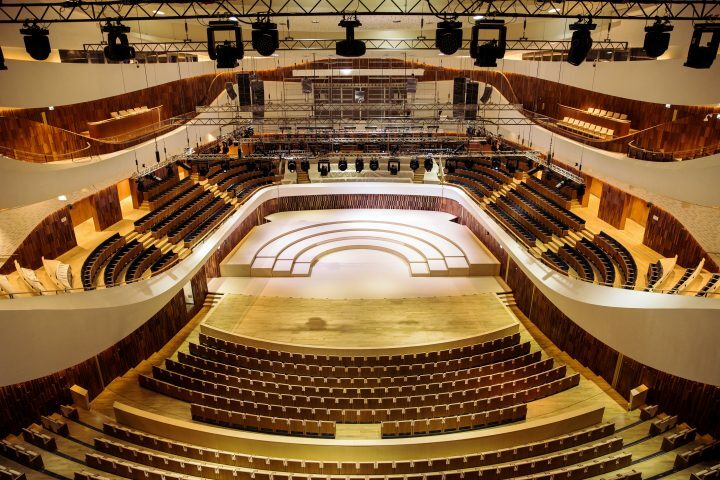 The project of the concert hall was certainly unconventional, a sufficiently complicated concept in terms of technical design, yet turned into a reality through the joint efforts of many Russian and European companies. The following News comes from our Partner and exclusive UK distributor A.C. Entertainment Technologies Ltd.
UK – Live events creative solutions specialist, Production Bureau (Pb) has invested in twenty Spotlight FresneLED 200 warm white universal dimming luminaires for use on client events during the busy autumn season. Production Bureau has been providing technical solutions, installations, AV equipment and services to the live events and exhibitions & display sectors for over 30 years, with projects ranging from international conferences to small-scale roadshows. Dave Morgan, Pb’s Technical Resources Manager, required a versatile and low-energy LED Fresnel that could be used across various types of shows and events, so contacted Bob Allen in the UK lighting sales team of professional equipment reseller, A.C. Entertainment Technologies Ltd. (AC-ET). After discussing Dave’s technical requirements and budget, Bob recommended the SpotlightFresneLED range of luminaires from the brand’s award-winning Green Line product range. Dave invested in a quantity of Spotlight’s FresneLED 200 warm white universal dimming luminaire, which have been used on a number of client productions and impressed Pb’s technical team. For more details or to arrange your Spotlight personal demonstration, please contact AC-ET on +44 (0)1494 446000 / sales@ac-et.com, or visit www.ac-et.com/lighting. You can find our new products at LDI 2018 (19-21 October, Las Vegas) at our booth #563, where our local distributor AVL MEDIA GROUP is looking forward to introducing you the Greenline range and the new fixtures of Hyperion Series. What to say… another great success of our new product! Thanks to our local distributor ASL Electronic. During the PLASA 2018 3-days exhibition in London, the vibe was electrifying! Many people came to test and see the housing of the new Hyperion Series (Fresnels and Profiles, 300W, 6 colours and Tunable White) at our local distributor A.C. Entertainment Technologies‘s booth. You can find our new products at DOKA CENTER’s booth, where our local distributor is looking forward to introducing you the new 6 colours fixtures of Hyperion Series. Since more than hundred years the old slaughterhouse has been in use and has been enlarged several times. After its closure in the 1990s the building has turned into a monument protected architectural jewel. Today the building is a one of a kind modern meeting and congress center. The main-building of the old slaughterhouse, the “Zollingerhall” serves nowadays as a conference and concert hall and was named after the architect Friedrich Zollinger. The label “Green Meetings” of the Marina Forum stands for sustainability, resource conservation and environmental protection. The label was also consistently implemented at the planning of the stage lighting. Efficient modern LED technology is used in the majority of the luminaires. In comparison to the purely scenic theater lighting the fixtures will have much longer working periods for conference use. Due to the 80-90% lower power consumption the operating costs are significantly lower compared to the tungsten luminaires. The lighting rig is including several Spotlight PC LED 200 PO, Cyc LED 300 and Evolution 25 H and additionally one VD LED 450W followspot. 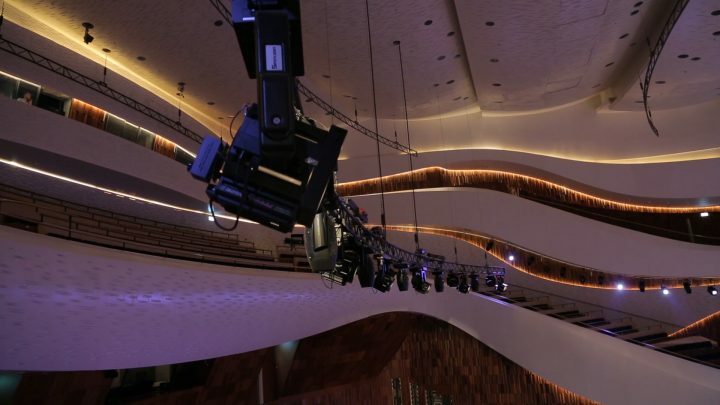 The conception of the lighting rig was carried out by Spotlight distributor Feiner Lichttechnik. To celebrate 50 years of innovation, Spotlight presents a new series of professional 300W LED luminaires featuring a new rounder, sleeker design. The new Hyperion series is designed for large installations such as theaters, film and TV studios with a performance comparable to a 2000W halogen fixture, but with a more compact size and reduced heat production. The colour version uses a system of six colours to generate rich saturates and subtle, theatrical pastels. It combines diodes that emit the usual primary colours – red, green and blue – with further sources of amber, cyan and lime. This combination allows the luminaire not only to emit a wider spectrum and with a more uniform curve, capable of producing white light with a colour temperature ranging from 2700K to 8000K, but gives also a minimum CRI of 94 and a maximum of CRI 97. This is a remarkable improvement of the average CRI compared to an RGB, RGBW or even RGBWA source. The cooling system combines large upper slots with active ventilation. It offers a standard automatic mode, a “silent” mode and a mode that allows the control from the console. Another adjustable parameter is the LED refresh rate, which allows it to be used in applications that involve video shooting, avoiding annoying flickering. In the 6 Colour version, the new source is combined with a sophisticated firmware that allows colour control in different modes. First of all, the “booster” that makes the fixture capable of self-powering the creation of individual colours when not all channels are simultaneously at full. Two other modes are especially designed for the use of the fixtures in the TV studio: for coloured light there is the HSI mode, suitable for use with cameras, while for white light there is a mode with the variable colour temperature and +/- green control. Another mode allows direct 8-bit control of the various RGBACL colours plus a general dimmer and variable speed strobe effects, while a last mode adds colour control with 16-bit precision, the virtual colour wheel, an independent control of colour temperature, dimmer and strobe. The source has two response curves for dimmer control via DMX: a linear one and one that emulates the response of an incandescent lamp. This last curve also includes the possibility of setting the delay typical of halogen lamps. For further realism in the emulation of tungsten sources, the white adjustment offers the traditional orange toning effect while decreasing intensity, also known as red, or amber shift. The module containing the source has 5-pin XLR for DMX & RDM in and through (the same connector also allows the firmware update) and PowerCon connectors for power in and out. An LCD display allows the local setting of the luminaire. This display is reversible and can be set for auto power off. The rear panel also includes two rotary encoders for the dimmer and the virtual colour wheel with 8 white colour temperature levels, plus a preselection of 30 main colours and 8 free presets to load the colours of your preference. A final feature on this module is the ease of maintenance: it has a hinge opening to allow easy access to all the components of the fixture. Thanks to these characteristics, the Hyperion luminaires are able to meet the most demanding requirements of professional users both for the quantity and for the quality of the light. All models are designed for optional wireless-DMX control, for yokes that allow the traditional pole control, and for mounting in one of the ARC series DMX control yokes (with pan, tilt and motorised zoom).